In the 17th Century, the British conquerors of Ireland implemented harsh laws aimed at eradicating Irish traditions. Irish were forbidden to vote, send their children to school, purchase land, or own a horse worth more than $25. Irish priests were driven out of the land & warned that they would be put to death if they returned. Despite all of this, on Christmas Eve Irish families of faith placed a single candle in their three front windows (or 3 in one window). The 3 candles stood for Joseph, Mary, & Jesus. They were placed there to signify to the traveling priests that they were welcome at their house to have a meal and celebrate Christ-mass with them. 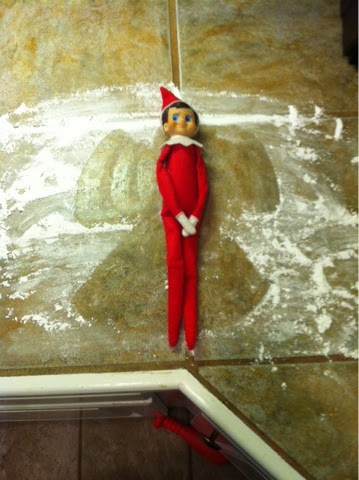 On Wednesday, the boys found Kingle in the kitchen making a powdered sugar angel. So we talked about angels! Angels seem to be all around us at Christmas time...on Christmas trees, nativity scenes, even in malls & department stores. They're seen all over, or all around us, because they are! They are a huge part of the Christmas story. They spoke to Mary & Joseph & the shepherds, & they filled the sky in celebration when Jesus was born! I love learning about angels. I just have so much respect for a creature whose sole created purpose is to exalt the Father & bring glory to Him. (Hmm...isn't that our sole purpose? ...ouch! Stepped on my own toe there.) There are special angels for certain jobs-worship, messengers, the "badest" fighters in God's army... I like to imagine what they look like. Of course, I first think of a blonde, chubby baby with a harp. But then I think of the Bible's descriptions...the many wings, specifically equipped for whatever task God created them (yeah, I could bust another analogy on us there too). I know they've got to be quite different b/c they're always having to tell people on Earth not to be afraid when they appear to them. I think of how they glow. My Sunday School teacher at FBC Vivian put a new theory in my head just this past year. He talked about how everything about an angel is to bring glory to God. He talked about how angels glow or seem to shine. He said that they glow because they have been in the presence of the Lord. He reminded us of when Moses was allowed to see the back of God with God covering Moses' eyes & how he came away from that experience with a "glow." The angels are constantly in the Lord's presence & the glow that they seem to have is God's! I really like that theory.